Check our compatibility guide if you want to know whether Acrolinx for Firefox works with your local platforms. You can use Acrolinx for Firefox to check content in editable fields on most web pages. Acrolinx for Firefox is great if you have web content that you want to check but don't yet have an Acrolinx product to use in your web CMS. For example, you can check content in articles you write in an online help center like Zendesk. You can even check an email in Gmail or check content in a Customer Relationship Management (CRM) tool. What content can I check with the Sidebar? How can I install, update or uninstall Acrolinx for Firefox? Acrolinx for Firefox is available on your Acrolinx downloads web page. You need a customer account to sign in. If you don't have a customer account, then contact your Acrolinx project consultant. In a browser window, open the Acrolinx downloads page and sign in. Download the Acrolinx Firefox Add-on . 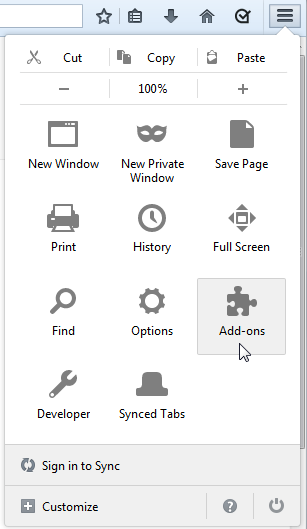 Open Firefox and go to Add-ons to to open the Add-ons Manager . You could also type about:addons in the address bar. Drag the downloaded file and drop it on to the Add-ons Manager page. Click Add when the notification appears that asks you if you'd like to install the add-on. When the installation is done, click OK .
To update Acrolinx for Firefox, first uninstall the previous version. Then simply follow the installation procedure for the new version as described above. Open Firefox and go to Add-ons or type about:addons in the address bar. Find Acrolinx for Firefox and click Remove . You can toggle showing and hiding the Sidebar by clicking in your Firefox toolbar. If you click to show the Sidebar and the icon turns red, , it means that we can't show the Sidebar on that page. Try to show the Sidebar on a different page. 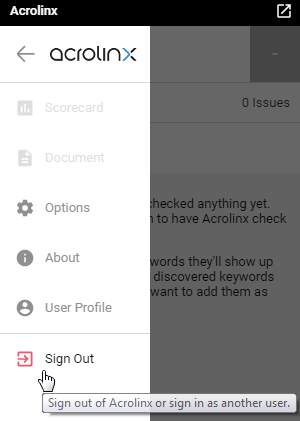 You can change your Acrolinx address by signing out and signing in again. Sign out from the slide-out menu in the Sidebar. Acrolinx checks content that's in editable fields on most web pages. What does my Acrolinx Administrator need to do? Secure the Acrolinx Server with SSL because Acrolinx for Firefox only connects to Acrolinx Servers using HTTPS. This means that the server address in the Sidebar has to start with the prefix HTTPS and follow this pattern: https://<SERVER_ADDRESS>:<PORT>. To use Acrolinx for Firefox you'll need to Enable Cross-Origin Resource Sharing (CORS) on the Acrolinx Server. Check out this article on how to Enable Cross-Origin Resource Sharing (CORS) on your Core Server . Older servers might need some extra help recognizing some https files. You can Configure Acrolinx to Recognize Your File Type. In the Acrolinx Dashboard go to Maintenance > Configuration Properties > server/bin/format.properties to edit. Add the property 10000.HTML = https?://. * and save the file. Make sure to restart the server to activate your saved changes.